In a historic development, the Britain has voted to leave the European Union (EU) after 43 years as the 'Brexit' camp on Friday took a seemingly unassailable lead over the 'Remain' camp in a down-to-wire referendum with far reaching implications for the world. As a fallout of the Brexit referendum, Indian equities have taken a hit with Sensex falling nearly 1000 points mirroring heavy volatility in the world stock markets. 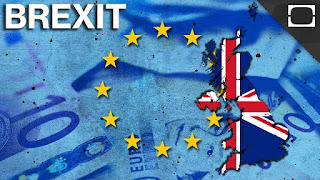 52% of the Britons in Thursday's vote favoured leaving the 28-member EU, while 48 per cent supported staying in the bloc. The final national result is to be officially declared by the UK Electoral Commission's chief counting officer. London and Scotland voted strongly to stay in the EU but the remain vote has been undermined by poor results in the north of England. Voters in Wales and the English shires have backed Brexit in large numbers. The vote - which saw an extremely high turnout of around 72 per cent with over 30 million people voting- reverses the public verdict back in 1975, when the UK voted to remain a member of then European Economic Community, which later became the EU.